Home » Geek Adventure » Binoculars are harder to come by than you would think…. I thought as part of the secret grown up club, every parent had a pair of binoculars. You know, stashed in that cupboard where they keep tins of nails and screws and a random assortment of plastic containers including the ‘sick bucket’ and the weird shaped basin you use to wash the windows. I was stunned to find that this wasn’t the case. My Granny used to have a pair that she would keep by her window under the guise of looking at boats on the Loch when we all knew it was to spy on the neighbours, particularly that dreadful women that lived in the next block of flats who had visitors at all times of day and night. Any mention of this wanton woman would result in a pursing of my Grannys lips and a reshuffling of her bosom. A quick survey of my immediate family revealed that none of them owned a pair. The search spread to my extended family and it was revealed that my Uncle had a pair and I was duly despatched to pick them up. Deciding that a road trip was the perfect way to spend an Easter Monday, Husband and I loaded up some sandwiches, drinks and the aforementioned binoculars into our car and set off to find our national beastie, Nessie. The scenery on the drive from Glasgow to Loch Ness was beautiful and relaxing, the drive itself was not. The volume of traffic travelling up around the side of Loch Lomond was just as busy as the M8 at rush hour as hundreds of other tourists had decided to check out the Scottish scenery at exactly the same time. There wasn’t really a chance to stop and admire the view as we were contending with caravans, convoys and rest stops full of parents taking their kids to pee in bushes. We managed to shake most of them off as we travelled up the side of the Loch and by the time we got to Glen Coe, the roads were fairly clear apart from the odd group of motorbikes. If you have never driven through Glen Coe, I demand that you get in your car immediately and make the trip. Seriously, put down your cuppa, get your shoes on and just get in the car and drive. If you are looking for a testament to just how small and insignificant the human race is, you just have to drive through Glen Coe. Some think that Glen Coe is Gaelic for ‘Glen of weeping’ with reference to the Glen Coe massacre that took place in 1692 when men of the Jacobite uprising slaughtered the MacDonalds. A somewhat romantic but macabre thought. As it turns out, the Glen is actually named after the River Coe which runs through it. Driving through the Glen gave me goosebumps. I had driven through it once before, at night, so hadn’t really been able to appreciate the splendour. This time though I was a passenger so I was free to gape and point. The rolling mountains, one after the other, made you feel like you were in a different land. A land away from motorways and skyscrapers and petrol stations. It all felt very ‘Middle Earth’. The mountains surrounding you on both sides left you feeling tiny and you could imagine in days of old, people travelling for days to get from one end of the Glen to another. In this modern age though, it took us minutes rather than days. Leaving Glen Coe behind, we got closer to our destination of Inverness. There is a HUGE tourist industry attached to the Loch, something that the local businesses embrace wholeheartedly. We knew we were getting close to the Loch when signs for businesses started to incorporate the monster into their signage. One of the local Inns had used an image the monster, the head being the letter ‘I’ with the humps of the monsters tail being the two ‘n’s to spell out ‘Inn’. This entrepreneurial spirit made you feel like the locals very much owned and loved the legend of Nessie. Arriving at the Loch Ness Visitor Centre, we were marshalled into a car park with busloads of other tourists. A quick look around the Visitor Centre showed us two things. No.1, there’s’ nothing that Nessie can’t be printed on and No.2 tourists will buy anything that has Nessie printed on it. We quickly realized that as cute as the cuddly Nessies were, they were not the reason we drove four hours to get there. We needed to get a good view of the Loch to be able to properly Nessie Spot. 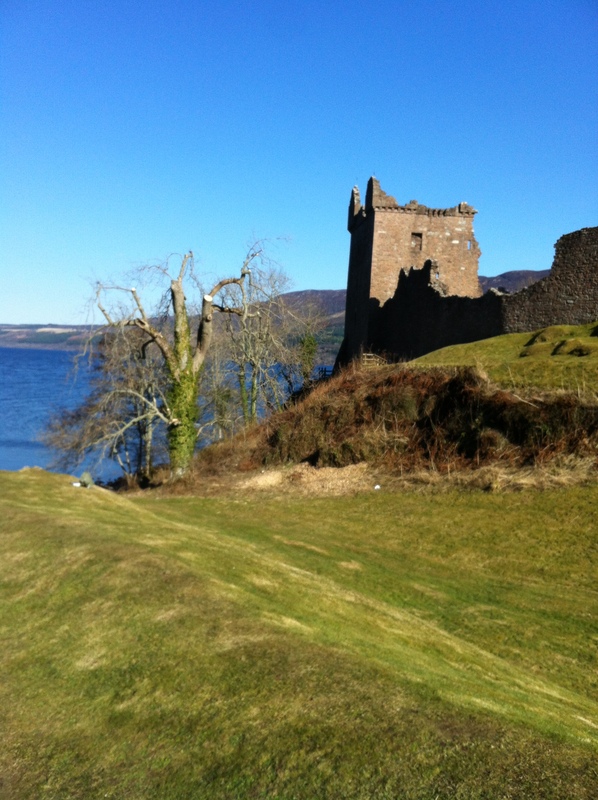 A quick Google brought up information on Urquhart Castle, which stands at the head of the loch and has fantastic views for miles on a clear day (which it was). So it made sense to head there. 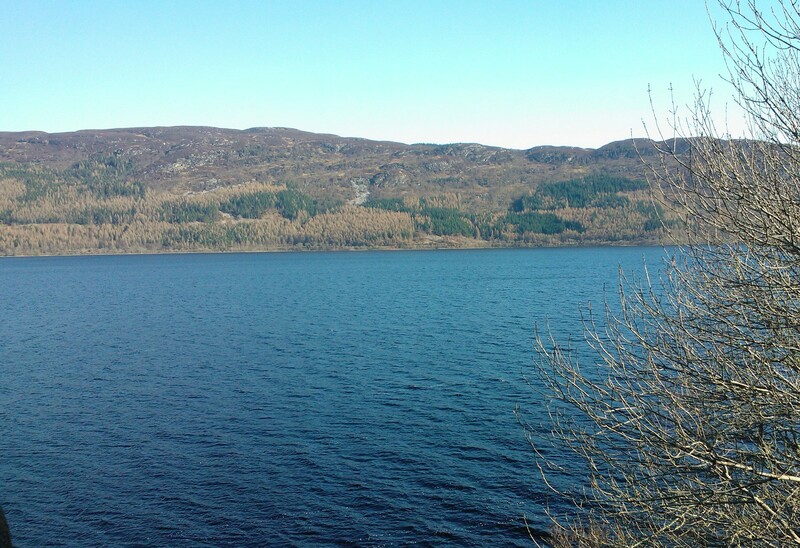 While we sat in the sunshine enjoying our lunch, I read out a few facts about Loch Ness from my phone. ‘Did you know that Loch Ness has more water in it than all the lakes in England and Wales combined and it is the second biggest Scottish Loch, the first being Loch Lomond?’ I read out to Husband. Fascinated by just how old this legend was, I read on. Back in the 6th Century, it was said that Saint Columba repelled the creature with the power of prayer. But recent day sightings kicked off in 1933 when London Man George Spicer reported seeing “the nearest approach to a dragon or pre-historic animal that I have ever seen in my life” while they were driving around the Loch. It had crossed their path while carrying “an animal” in its mouth. If the sightings went back for centuries then was it a possibility that todays Nessie was a descendent? Perhaps she was not the only one but part of a family of a previously undiscovered species? Eager to start our search we finished our lunch and fished out our binoculars and a blanket. We paid into the Castle, not without grumbles from Husband about us being taxpayers so why did we have to pay, and followed signs proclaiming ‘To The Castle’. Of course, entry to the Castle could be found through the gift shop filled with stuffed Nessies….. I did have a game plan for trying to find the elusive monster. My first tactic was going to be getting to the highest point that I could and then sweeping the loch from left to right. Then I would choose a midway point and do the same. If that failed I would go down to the waters edge and see if I could see anything protruding out the water that wasn’t supposed to be there. If all that failed I was then going to attempt my tried-and-tested method of giving up and then nonchalantly letting my gaze fall upon a random piece of water in the hope that I would see something. This method was usually reserved for when I had lost my glasses but I had great hopes that it would reap great rewards in our hunt for Nessie. The stairs in the shell of the Castle were very narrow which was fine for my tiny feet but posed more of a problem for Husbands Size 12s. The narrow winding staircase meant that while I tiptoed down he had to go down sideways. I half expected him to start doing the can-can on the way down. For the next 90 minutes we explored the Castle, up and down narrow staircases, stopping at the best viewpoints to try and get a glimpse of the mythical beast. In my head I had already daydreamed about the moment I discovered it. I would spot something rippling underneath the surface that would catch my attention. Upon closer inspection, I would realise that this was a hump. Zooming in and scanning a bit further on, there would be another hump. And another! I would yell ‘Nessie’ and the assembled tourists would quickly spot the creature causing much waving of arms and cries of delight. As luck would have it, an international reporter and their cameraman would be taking an hour break from a local news story and would turn their camera on to the water. 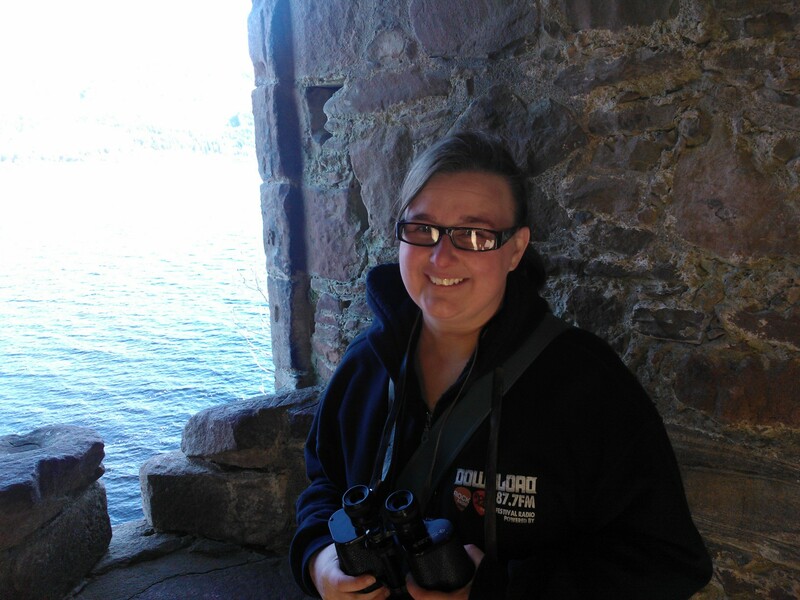 I would be interviewed and forever be known as the woman who spotted the real Nessie. Fame, fortune and internet memes would follow. After a brief spell in rehab after the fame got just too much, I would return to the world and proclaim ownership over the creature. A lengthy court battle would follow until eventually I would win custody of Nessie and live in a house on the shore, coming down every morning to the water edge to feed her. We would grow old together and she would outlive me as she has outlived many other generations. 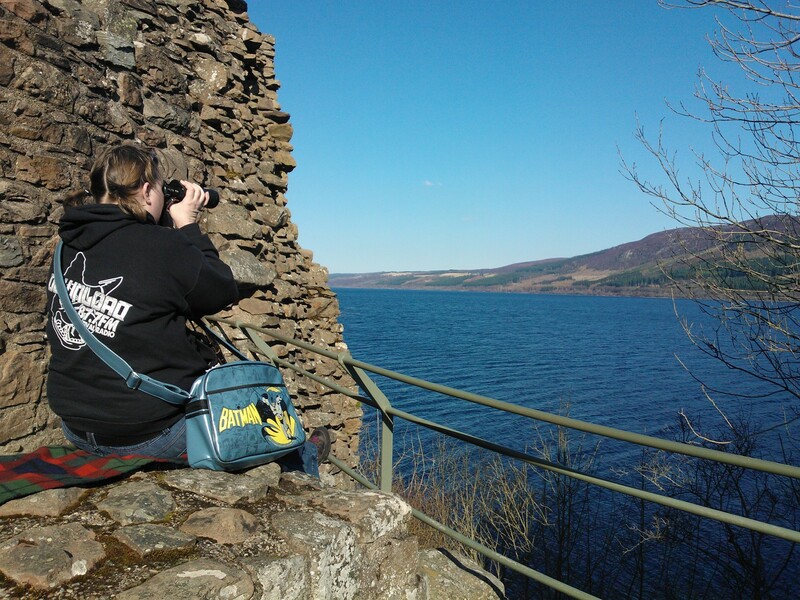 Binoculars at the ready – Nessie where are you? Coming back to reality, as the wind got a bit colder, the warm enclosure of the car was calling and Husband was starting to look bored so we decided to have one last sweep of the castle before heading home. ‘Do you think anyone will ever find Nessie?’ I asked Husband while studying the calm waters of the Loch for any suspicious looking ripples. Myth! I know in my heart that Nessie is out there and as we climbed the stairs to the exit I threw one last look over my shoulder in case I spotted something out of the ordinary. There was nothing there except for the small ripples on the water caused by the wind which was starting to pick up. I knew the minute I turned my head away, I would miss my chance but the decision between setting up camp here for the rest of my life, chasing a ‘myth’, and the warmth of the car and getting home to my bed was an easy one. Back in the car, music playing and the beautiful scenery on either side of me, this was one item from the list that I was sad about crossing off. I think that an Annual Nessie Pilgrimage is in order. You just never know when she might pop her head up!